“Dar El Awlad” (which means “The Children’s Home” in Arabic) is Kids Alive’s current longest running program – almost 70 years old. 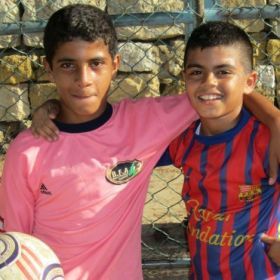 The Dar El Awlad Children’s Home provides a home for 30 vulnerable boys who have been orphaned or are from families too poor to care for them. Though the boys come from a variety of religious and ethnic backgrounds, all of our staff members are Christians who are committed to modeling and sharing the love of Jesus. Between the ages of 4-18 years old, these boys live in family-style apartments. Each unit has bedrooms, a kitchen, a sitting room, and they share facilities such as a chapel and outdoor play space. Kids Alive is privileged to give the boys shelter, food, clothing, medical care, education, and a house mother who loves them and makes the house a real home. Those in younger grades attend school on the Kids Alive campus, while older students attend schools in Beirut. Our older boys, aged 15 and over, live in one apartment on campus called the “Bell House.” Here they receive love and support from our Older Boys Supervisor as they transition to independence – learning and experiencing the freedom and responsibility that come with adulthood and living on their own. Most of the care for the boys is provided by national staff, but missionaries also lend support. We encourage Service Teams to come and share their skills with this ministry! Your support is vital, as we provide quality, holistic care to at-risk boys and young men this volatile part of the world. Support the Ministry of Dar El Awlad Children's Home with Your Gift Today.